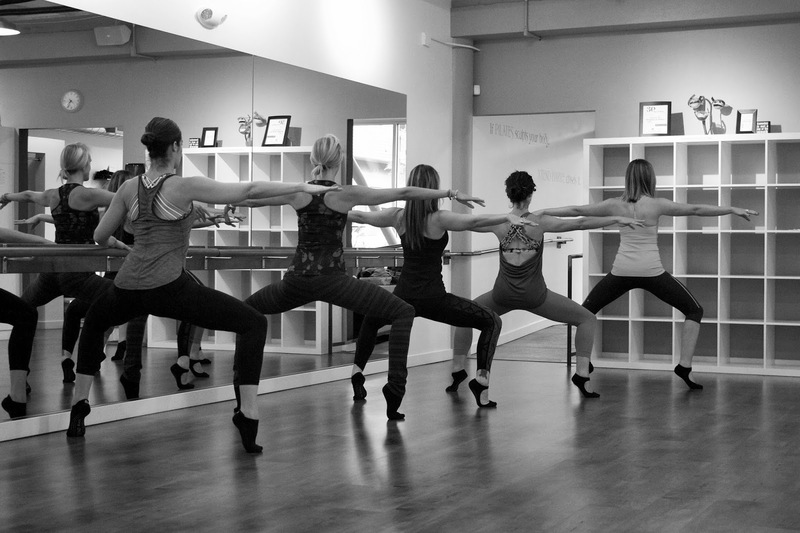 Jessica Natonick, owner of Xtend Barre Studio Portland, is passionate about her studio. Jessica is creating an environment where everyone is welcome, regardless of age or fitness level. She is providing a fitness program that is challenging, yet safe and fun. Jessica is building a community of fitness, support and encouragement right in the heart of SE Portland. What is Barre? Before meeting with Jessica, I wasn’t quite sure what all these Barre studios popping up over town are about. Jessica educated me. She says Barre is a fusion of Pilates and ballet, but with more cardio. A lot of the work happens at a ballet bar using basic ballet dance moves, but it also uses the foundations of Pilates. It’s a full-body strength training and cardio work out to music that feels a bit like dancing, but dancing skills are not required. Dance Without Dancing: For example, a typical work out might incorporate a series of plies at the bar. Class members would perform plies in short sequences at a quick pace to get the heart rate going while building strength. This is all done to the beat of music, usually an 8 count rhythm. The instructor always demonstrates any move first and provides optional alternative moves for class members at different levels of ability or experiencing an injury. Jessica says it’s not designed for dancers, but is a fun way to safely get fit and to look like a dancer. Maybe it’s like bringing dance to everyone, even those of us with two left feet. Maybe it’s like dance without dancing. More Ways to Barre: This whole workout was starting to sound fun to me (and I was never a fan of aerobics), so I asked for more detail. Jessica explained that most of the classes at her studio have the same structure. Class begins with some type of short warm up of about 5 minutes. The workout will include time working on the upper body, time working on the lower body and the abs, and of course time at the bar. The studio does offer some different classes, including TRX, which is a type of suspension training using body weight for resistance. The studio also offers Xtend Barre Stick that uses a resistance cord, Circuit Boot Camp and Pilates mat classes. Back to the Barre: Jessica says she discovered Xtend Barre almost by accident. She’d always been passionate about fitness and practiced Pilates. One day she went to a group Xtend Barre class, hoping to hide in the back and not get noticed. She doesn’t like to dance and was not really expecting to get hooked. However, she was shocked. She liked it, found it challenging and just kept going. She eventually became an Xtend Barre trainer and worked as an instructor part-time. Owning It: Jessica was living in Washington, DC at the time and was working as a guidance counselor. Her husband, originally from Portland, wanted to head back. Jessica loved teaching the Xtend Barre classes and decided to open a studio in Portland once they got here. She diligently planned for the stuido before the move, traveled back and forth, and ultimately picked out the spot for her studio on SE Division. She likes the location because of the community spirit in the neighborhood, and of course the walkability and access for the people who live there. Community Spirit: I think that community spirit is part of what moves Jessica and what she’s building at her studio. She says it’s important to her that the studio feels local and reflects the community and Jessica’s style. I sense she’s accomplishing that. Jessica says friendships form at the studio. Couples come to classes together. Clients have been as old as 88 and as much as 9 months pregnant. They just keep coming because it’s fun and because they love how their bodies tone and their fitness improves. No Hiding: Well-trained instructors teach all the classes, which are limited to 20 people. Jessica reports that often classes are smaller than that too. There’s no hiding in the back of the class, but why would you want to? The instructor is there to coach and encourage you and to help you get the most from the workout within your ability and without getting hurt. Jessica says the Xtend Barre workouts are some of the safest workouts you can do. Earning is Fun: Jessica tells me she loves owning and managing this studio. She loves helping her clients feel good about themselves and watching it happen. She watches her clients earn their new fitness and happiness and sees them enjoy the process. While talking to Jessica, I felt her excitement and enthusiasm. In fact, I left our meeting thinking I just may have to give Xtend Barre a try. I know there will be class just right for me, and I’ll hopefully get the chance to chat with Jessica again. Check out the schedule of classes and learn more about Xtend Barre Studio Portland on-line.